The camera is the invention which brought the world to capture the memories and keep them forever. Around the world museums, memorials and government buildings are flooded with photographs of world leaders and things alike. With the invention of the camera in a smartphone, the world came real close as the photographs were shared on online channels instantly. Rear camera smartphones were the trend but then the whole of the action moved to the front camera giving us what we call as a Selfie Experience. Selfie Camera gained wide acceptance and grew from VGA to now more than rear cameras megapixels or to dual cameras as seen in most of the smartphones these days. Vietnamese Smartphone brand, Mobiistar is one of those brands which beliefs in the principle of ENJOY MORE! They have come up with their smartphones in India which are launched in collaboration with Flipkart where you can check out its amazing 120-degree wide angle dual selfie camera capabilities. I had an Enjoy More moment some months back at the birth of my second child after a gap of more than eight and half years since I became a father. My elder daughter was very eager to have one of her own brothers or sisters as she felt alone while we both go the office and in the day to day struggles or the rat race to meet your goals. The gap became wider and wider because of working locations and other commitments like not able to take maternity holidays in the first year of your job with the new organization. 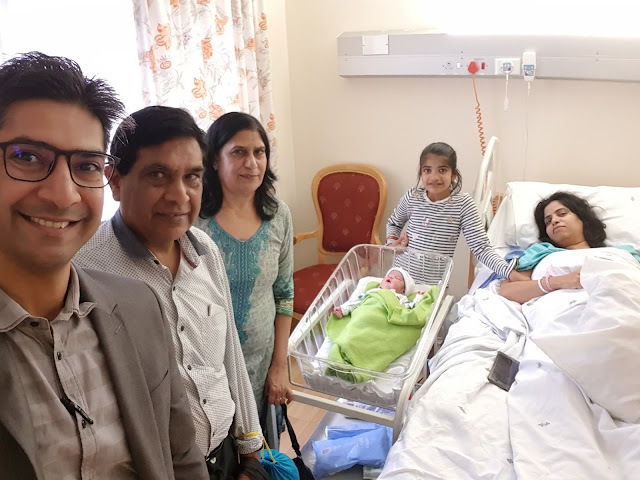 Check out this selfie right from the hospital as my wife came out of the operation theatre and icing on the cake was that my parents too reached our city on the same day just hours before the birth of our child whom we named Reyansh - meaning a Ray of Light. Playing with him is just like playing with a toy and I really could relive the moments which I could not with my elder one. I was sent to London for a project assignment whereas my wife and daughter stayed back in India when she was just 11 months old. My wife got the opportunity to work again when she was 6 months old after a gap of two and half years. And I only came back after she celebrated her 2nd birthday too without me. It was a huge sacrifice for which I have no reasons or arguments to justify the same. With Reyansh in my hands, I thank Almighty Lord that I was there for him from the time he was conceived to the caesarean birth time and out of the hospital. I take time to spend with him every morning and in the evenings to enjoy the parenthood which I missed earlier though I was with Keisha for around 11 months. Little kids are like a flower for which you smile as you look at them every once in a while. I always make it a selfie moment every weekend so that we can remember how it was to do his first things. I still remember when Keisha went to see her first movie, we met Amitabh Bachchan just randomly without any expectations. He came right into the PVR Gold Class lounge at Ambience Mall, Gurugram and sat just behind where I was sitting and later came Ritesh Deshmukh and Jacqueline Fernandez. Such moments in life can only be captured if you had a selfie camera which clearly I didn't have at that time but now I am sure, I will definitely go for Mobiistar #StarSelfieSeries Dual-selfie camera smartphone to capture both my family as well as the locations where we take Reyansh on his first tours around the world! Till that time....keep clicking on your smartphone and keep making memories with you in them too!! !